These roasted potatoes and rainbow carrots have become one of my favorite side dishes because they’re easy to prepare, versatile, and absolutely delicious! 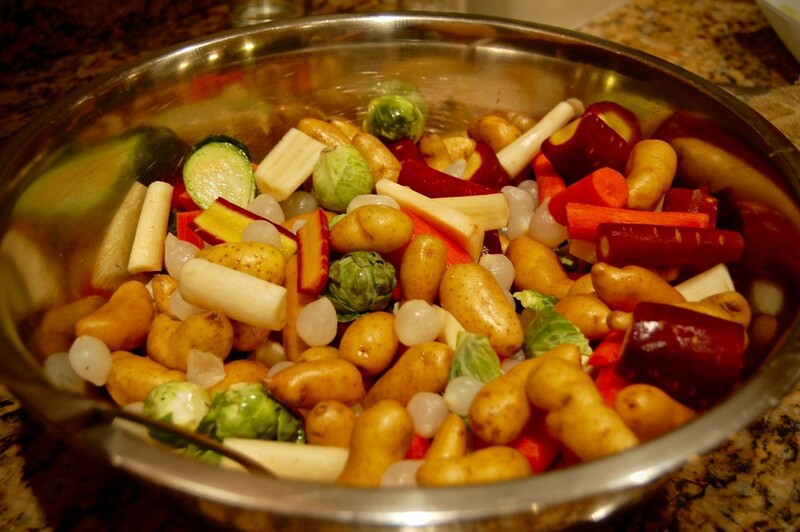 The rainbow carrots and brussels sprouts make this a really colorful fall dish- perfect for Thanksgiving. Speaking of Thanksgiving… IT’S TOMORROW!! I absolutely can’t believe how fast this month has flown by! I am so excited for this holiday. It combines some of my favorite things in life; family, friends, and food! By now you probably have your thanksgiving menu all planned out and grocery shopping all done. But just in case you’re looking for another easy side dish to make, or are planning a quick run to the store-give this recipe a try. At the very least, save it for next time you’re cooking dinner this season. These ingredients can be found at most supermarkets, but I pick them all up from Trader Joe’s. 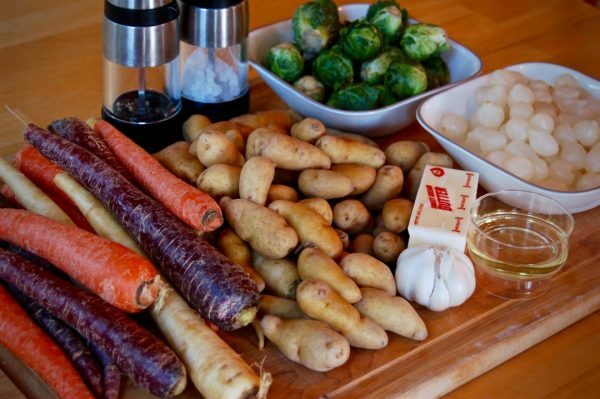 *I doubled this recipe because I was cooking for a larger group of people, so don’t be surprised if you seem to have less than the ingredients pictured. Rinse baby potatoes and peel the carrots. (I love how simple and quick the prep work is for this dish.) And aren’t these carrots beautiful? Who would want to eat plain orange ones when these exist! 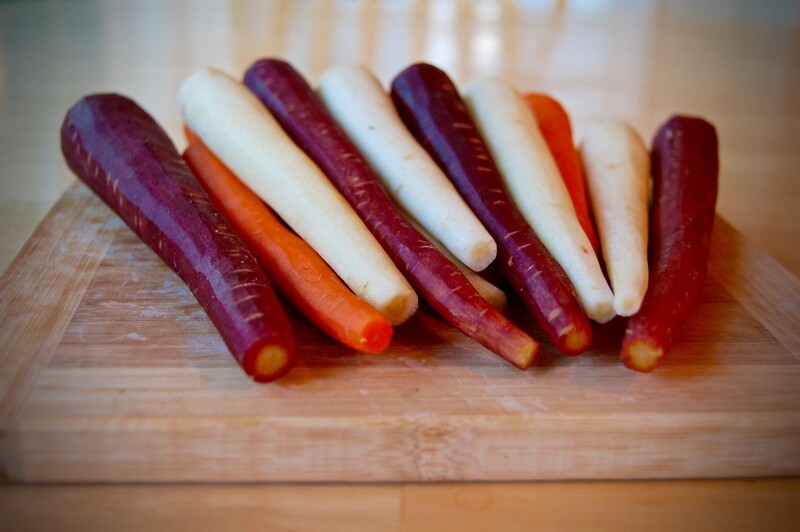 Cut carrots into 2″ pieces. Rinse brussels sprouts and cut them in half. 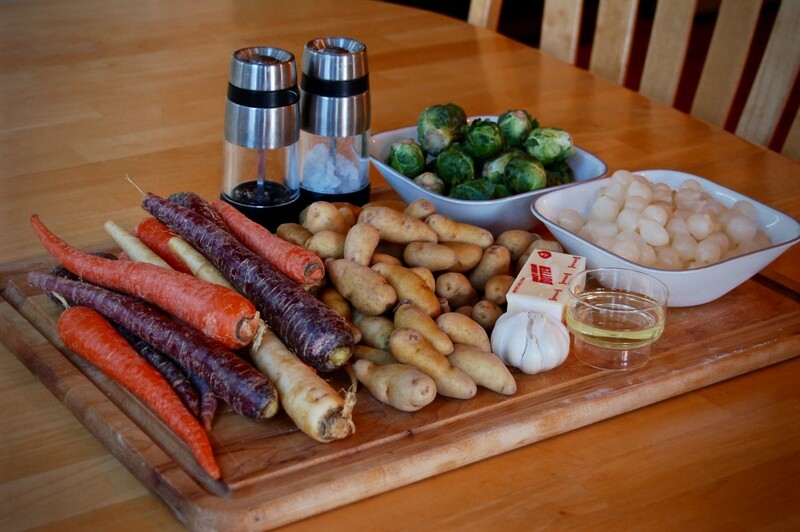 Combine potatoes, carrots, brussels sprouts, and pearl onions in a large bowl. Tip: the only reason I even have pearl onions in this recipe is because I’ve discovered the peeled & frozen ones from Trader Joe’s! I do not recommend spending 30 minutes peeling pearl onions, so if you don’t buy these adorable pre-peeled ones, just cut up a regular sweet onion. Mince or press the garlic cloves and add to the bowl. Fresh garlic just tastes so much better than powdered! Toss vegetables in melted butter and olive oil. Season generously with kosher salt and some fresh ground pepper. 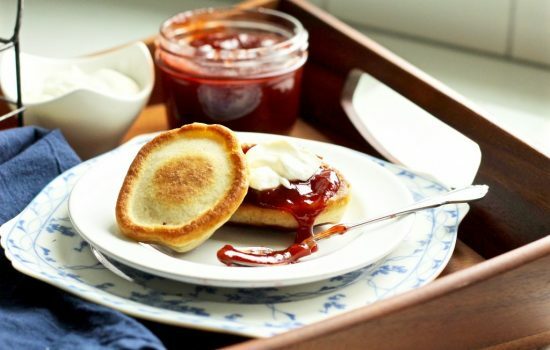 Spread evenly on parchment-lined baking sheet. The parchment paper is key here! I’ve tried using wax paper and foil, but it didn’t turn out well and the vegetables got stuck to the bottom. Bake covered in foil for about 50 minutes (until vegetables are fork tender and roasted on the bottom). Uncover and bake for another 5 minutes to crisp up a little. 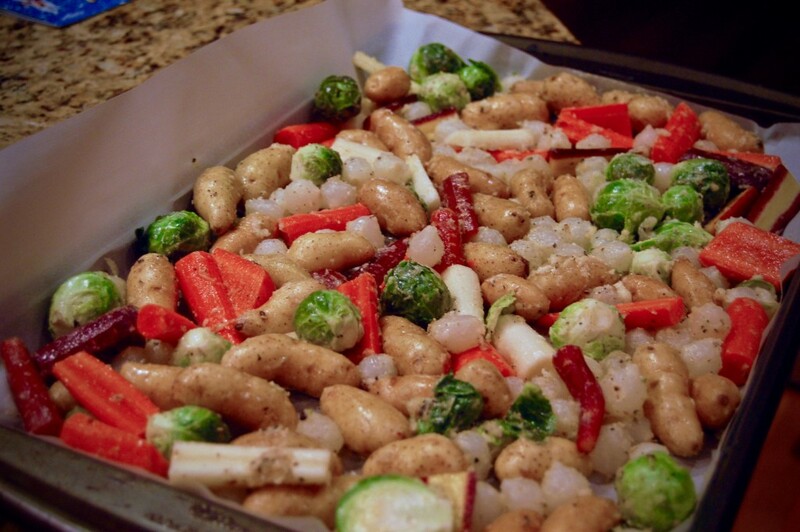 Taking the vegetables off the parchment paper will be a breeze! 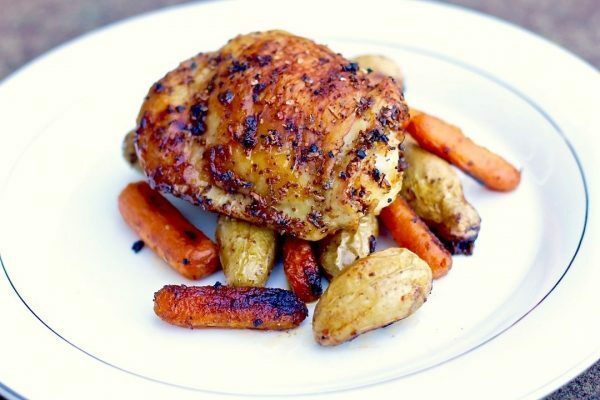 You’ll get golden roasted potatoes and carrots without any mess. 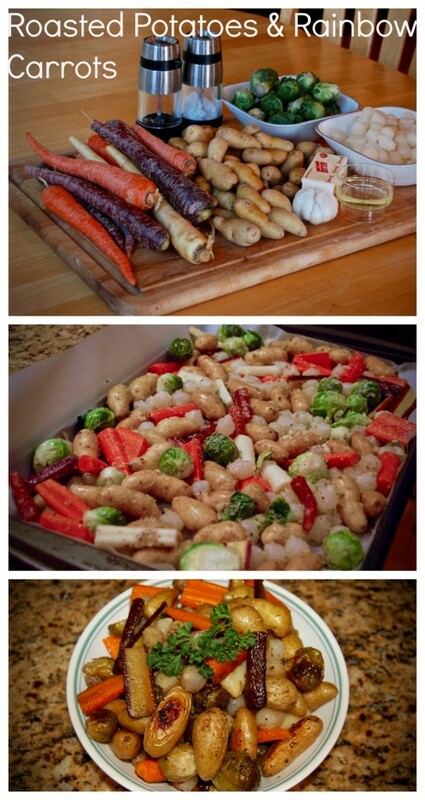 Serve these roasted poatatoes and rainbow carrots with Thanksgiving dinner or any dinner in need of a delicious side! 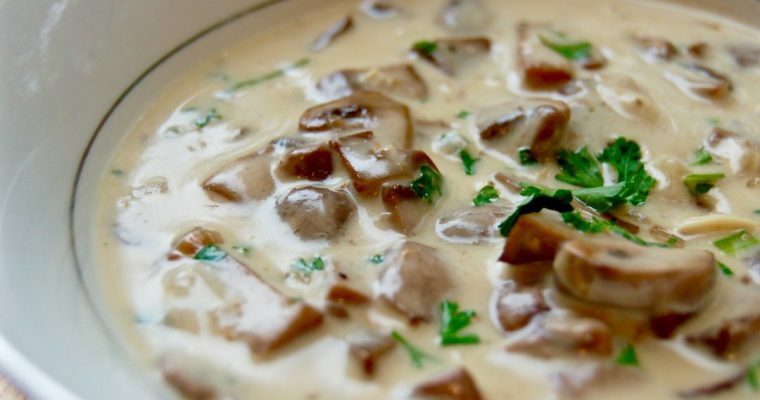 I served them alongside my crispy baked chicken thighs and white wine mushroom gravy. It went so well together! Your love for food and ingredients is absolutely priceless! Keep up the good work. Great blog!! Wow, thanks for the encouragement Victor! We’ve got so much more we want to share! Glad there is someone who appreciates it.